We have been learning about lifecycles in our science lessons. We watched each caterpillar turn into a chrysalis and then out came these beautiful butterflies. We waited for the sun to come out on Friday and released the butterflies into the courtyard which is full of flowers. The butterflies were friendly - lots of us got to hold them gently. When we let them go, they flew to the gorgeous flowers to drink the nectar. We had a fun afternoon today making our Moon Buggies! Last week we designed them and today we made them from junk. Some of us even cut with a saw! Our wheels move round and we decorated out buggies to make them beautiful. Thanks so much to the parents who came to help us cut, stick, saw, make holes and have a wonderful creative afternoon! What a fun day we had at Winchester Science Centre, taking part in lots of hands-on activities to help our learning about science and space. We also loved the spectacular show in the planetarium. We will be starting our new topic 'Explorers' in the first week of term. This will include learning about Christopher Columbus and Neil Armstrong. To support the children's learning about space exploration, we have planned a visit to the Winchester Science Centre on Tuesday 12th March. Letters will be coming home in book bags soon. 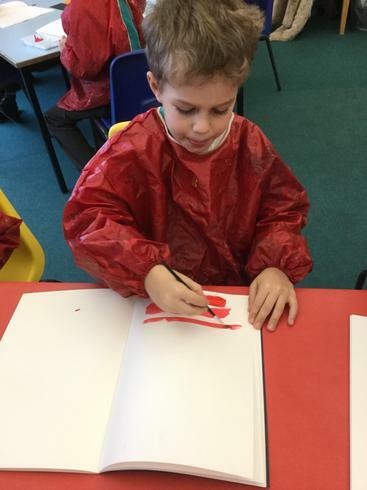 This half term we have been practising our colour mixing. 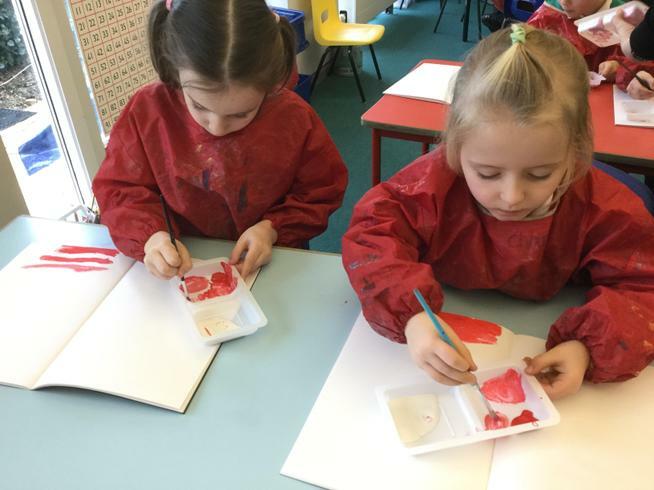 Today we mixed our own hot or cold colours. Didn't we do a great job!? 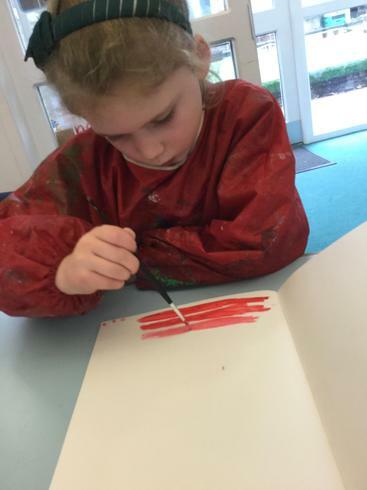 We were so careful to hold our brushes properly and to mix the colours we wanted. 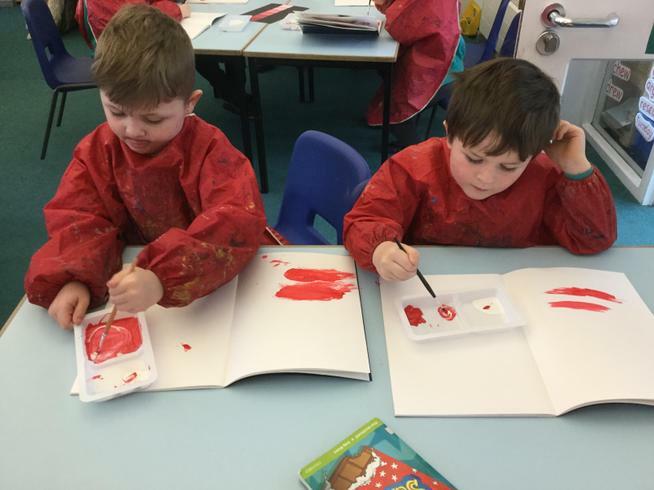 We are very proud of our fabulous paintings. Thanks v v v much to Katie who helped in class today! 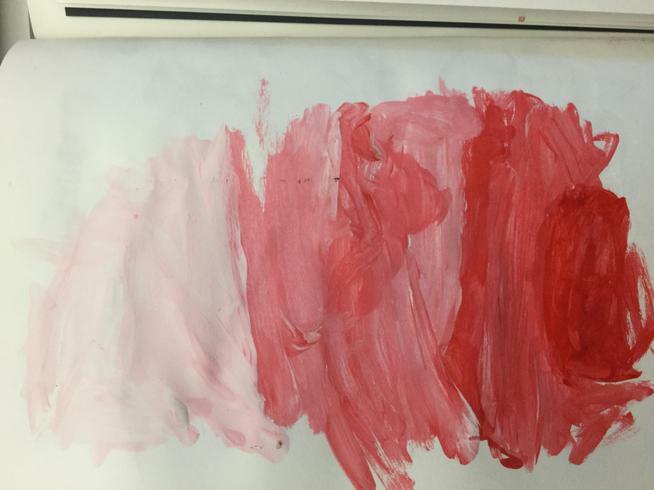 And apologies to any mums of children that came home a bit painty. We did wear aprons.... Sorry. We had a super day at Marwell today. We started with a workshop in the Education Centre. We learnt about different habitats and the animals that live there. Ask us who lives at the North Pole? What special characteristics do these animals have? Why? We also learnt about the African Savannah and the Rainforest. We all stroked a hissing cockroach from Madagascar! Then we walked to the 7 giraffes. After lunch we went to the Meerkat talk. Kim told us all about meerkats and we asked her lots of questions. We compared the Golden Mongooses with the Meerkats. We walked out past the amazing Snow Leopards - they were active today and one tried to knock it's friend off the perch. The rain started as we got onto the coach! Thank you so much to the wonderful parent helpers - we loved having you with us. 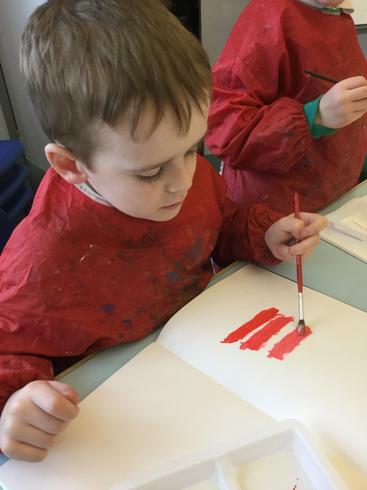 In art this week we have been learning about tinting. Ask your child what this means. 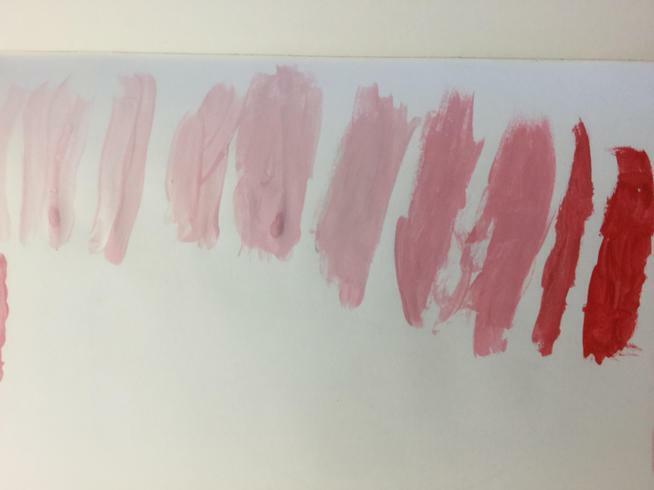 We gradually added white to red to create a range of pinks. 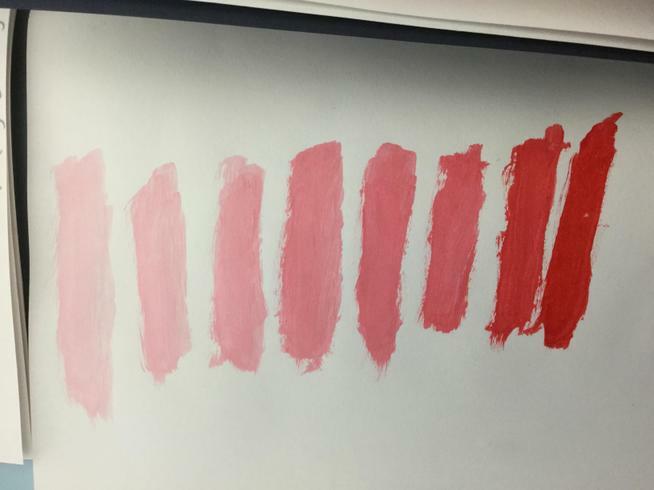 This is called tinting. We hope you have a lovely family Christmas and a peaceful New Year! Thanks so much for all the lovely gifts and kind messages in cards. Some photos of today! 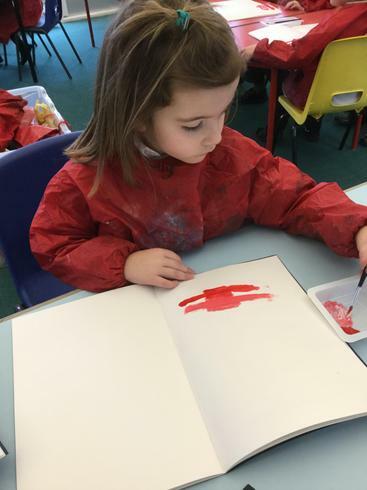 We had a super time painting! We made Christingles with Mrs Fitchet and Mrs Skinner. Ask us what the different items represent. Hope you've enjoyed lighting them at home? Welcome to Year 1 Bramshaw Class! We hope you enjoyed watching us sing and dance? Congratulations to the Year 1 chilren with speaking parts - you spoke beautifully clearly and loudly.